With each Marvel-ous Monday article, we get closer to the much-anticipated release of Captain Marvel. MCU fans seem to be a bit torn over this release, and I really can’t remember the last time a Marvel film was met with as much pre-release criticism as this one. 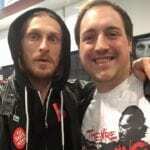 Some criticism involves the timing of the film in relation to Endgame. Others harp on Captain Marvel’s powers and her rightful place in the Marvelverse. Regardless of why you like or dislike the character, there is one thing we need to keep in mind: Marvel always comes through in delivering developed adaptions with a multitude of purpose. I, for one, am excited for Carol Danvers to hit the MCU, and who she squares off against in this origin-based flick has been debated. As many speculate Jude Law’s character–or characters according to some theorist–will be in play, one villain who has been marketed pretty heavily is that of Skrull militant Talos the Untamed. 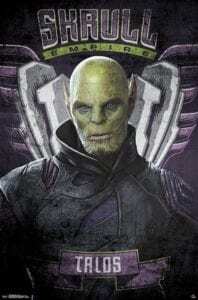 As discussed in previous posts, the Skrulls will be the antagonist race for this film and could/should serve a larger role in the intergalactic affairs of Phase 4 and beyond. Known for their ability to shapeshift, this extraterrestrial group has its origins traced to the Celestials, which is one of the most powerful groups in the entire Marvelverse. Without diving into too much background on the Celestials for now, you should know they are often classified as “space gods” or humanoids. (Do you remember Peter Quill’s father Ego in GOTG vol. 2? He gave us brief history of the Celestials and claimed to be one.) The group is comprised of some of the oldest beings in the universe who are responsible for creation and life as we know it. The origin of the Celestials is often unknown or unexplored, but Thanos once ranked them in the same league as Galactus, who opposes them. Anyway, the Celestials are often credited with the creation, or reanimation, of the Skrull race based on genetic experimentation with reptile-like creatures. Many fans are familiar with the Kree/Skrull War story line that captivated readers in the early 1970s, running through The Avengers title. The War has also been revisited since then by way of sub-stories and tie-ins. This century-long, universe-wide turf war features groups like the Supreme Intelligence, the Kree, and the Avengers, with Mar-vell’s Captain Marvel playing a crucial role in the story. This nine part story introduces and solidifies the Skrulls as being an enemy to Earth, despite the Kree’s aggressive militia causing the Skrulls to retaliate in some crazy barbaric ways. Now, many speculate the war will be referenced in Captain Marvel and could have some major impact on Phase 4 and beyond. The Skrulls also serve as the antagonistic group in another popular Marvel crossover. Fast forward to 2007 and welcome in the Secret Invasion story line. Here, the Skrulls use those handy shapeshifting abilities to impersonate our illustrious heroes. Again, the Skrulls are provoked into battle after a confrontation with the Illuminati, and many battles over Earth take place. As one can see, the Skrulls are a manipulative force with only their best interests in mind. Out of several formidable Skrull leaders and insurgents, Marvel seems to have highlighted Talos as the major adversary to Carol Danvers. Talos is a decorated Skrull warrior who, unlike this brethren, does not possess the ability to shapeshift. With this scaly chip on his shoulder, he takes out his frustration on the battlefield and earns the nickname “the Untamed” due to his unpredictability and ferocious style. His character made its comic debut in the early ’90s, so Talos is a relatively new compared to other famous Skrulls. 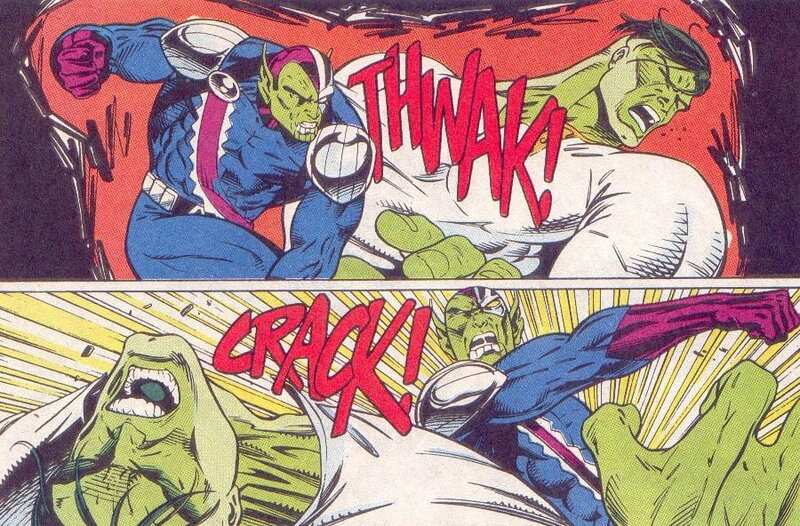 The Skrull radical possesses superhuman strength and durability, which many attribute to the aforementioned defect regarding his inability to shapeshift. For example, he was able to fight the Hulk and hold his own for the most part (even though the Hulk let him win). Such battle takes place after Talos’s falling out, of sorts, with the Skrulls. Long story made short, Talos offends the Skrulls and disobeys Skrull law by refusing to commit suicide after being captured by the Kree. This disgrace earns him the new nickname of Talos “the Tamed,” but he does regain some favor based on his “victory” over the Hulk in battle and some other accomplishments in other story lines. 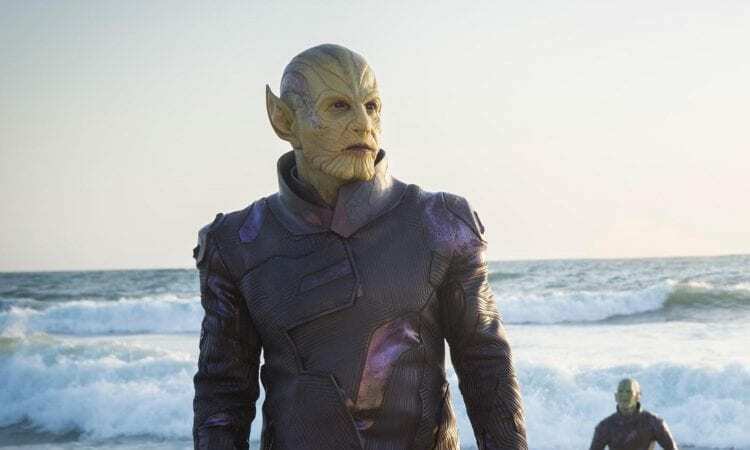 The MCU has done a great job introducing alien races and other groups throughout the yeas, and I am sure Captain Marvel will be no different in fully introducing the Skrulls to the MCU. As I am sure you know by now, Captain Marvel will fly into theaters March 7 for early showings.